PALM SPRINGS, CA (December 20, 2016) – Over 1,500 D.A.P. supporters will walk the red carpet at the Palm Springs Convention Center when they attend the 2017 Steve Chase Humanitarian Awards gala benefitting Desert AIDS Project on February 11. The red carpet will be flanked by an art installation featuring the sculptures of Karen & Tony Barone and over 100 D.A.P. volunteers ready to usher the fashionable crowd into the reception or to one of the media fashion outposts near the carpet for interviews with local media and fashion celebrities. As sculptors, Karen & Tony Barone have amassed a “big” reputation for life-size figurative and larger-than-life metal sculptures in sparkly & shiny paint colors. The couple built a name making important the things sometimes considered ordinary. For 23 years, the Steve Chase Humanitarian Awards gala has raised millions of dollars to care for people living with HIV. First organized by and named for famed interior designer Steve Chase – a former D.A.P. donor, volunteer, and board member – the gala is a highlight of the desert social season. D.A.P. is proud to welcome a new major sponsor this year – Alta Verde Group and its founder Andrew Adler. Details are emerging about the exclusive VIP pre-event presented by Patti and Jack Grundhofer with additional sponsorship from Eisenhower Medical Center. The location is the fabled Pond Estate, home to some of the valley’s most memorable fundraisers. The property was built for Robert and Jo Pond in the late 1980s. Robert Pond co-founded the Palm Springs Air Museum and both he and his wife were active in philanthropy. The estate features a white Spanish-style mansion and two guest houses creating a retreat compound with a total of 10 bedrooms and 19 bathrooms. ‘The Chase’, as many call the gala, has a reputation among trend setters as one of the few gala events at which attendees are encouraged to have fun and take risks with fashion. Returning Co-Chairs Dr. Suzanne Quardt, MD, Patrick Jordan, and Dave Morgan promise the same sort of audience frenzy delivered last year by Chaka Khan, who caused the audience to jump out of their seats and join her at the front of the stage to dance while singing along with the iconic performer. 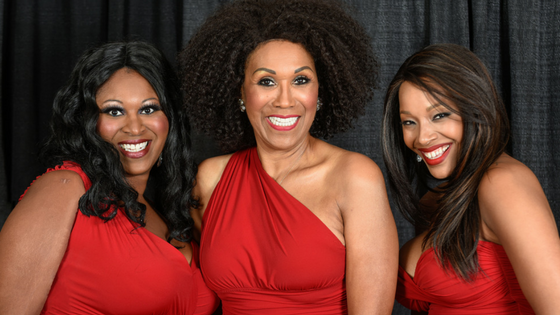 This year everyone is sure to be singing “I’m So Excited” when The Pointer Sisters headline the show! Patrons of the gala know to pace themselves during the evening so they have energy left for its famous after-party, which will feature performances by the 90s dance duo LaBouche, DJ’s, and a series of tightly guarded surprises revealed as guests dance the night away. Humanitarian Barbara Keller who served as Steve Chase Co-Chair for seven years and continues to serve on the D.A.P. Board of Directors and Co-Chair of 100 Women annual giving program. Eisenhower Medical Center’s President and Chief Executive Officer, G. Aubrey Serfling and its Executive Vice President and Chief Operating Officer, Martin J. Massiello. Eisenhower Medical Center is a strategic partner in achieving D.A.P.’s Get Tested Coachella Valley’s goals of routinizing HIV testing and linking people diagnosed with HIV to care. People can carry the HIV virus for years and not know it. The only way to know if you have HIV is to get tested. Your support enables D.A.P.’s Get Tested Coachella Valley program to provide free and confidential HIV testing at hundreds of community events and dozens of test sites – from health fairs and food banks, to Walgreens and D.A.P.’s sexual health clinic, The DOCK. When someone with HIV is on the appropriate medications, they become 96% less infectious to others. Thanks to attendance at the Steve Chase and other fundraising events, Desert AIDS Project ensures that newly-diagnosed HIV positive patients receive the medications they need to survive and thrive, and regular follow-ups to safeguard their well-being. D.A.P.’s Patient Assistance Program secures critical HIV and other medications at reduced cost. To buy tickets to the 23rd Annual Steve Chase Humanitarian Awards, go to DesertAIDSProject.org or call 760-992-0445.